Al Qaeda strikes Welsh Highland Railway? First man to climb Everest, first man on the moon and now the first passenger train from Caernarfon to Porthmadog. 30th October 2010 will go down in history as a day of triumph over challenge. This special train was by invitation only to donors of the Welsh Highland Railway with the most generous seated in the Pullman carriages. £28m is the cost to date of opening the service. I chatted with fellow passengers, mostly male with an engineering inclination – my naïve questions generating impromptu lectures into subjects such as the finer points of pressurised versus gravity-fed sand dispensers to reduce wheel spin. Across the aisle, with his flat cap angled towards the open window, like a doctor listening through a stethoscope, a carriage-building volunteer commented to his friend on the quality of the track ‘this bit runs very sweet’. The couple I shared a table with reminisced how years ago they had walked the first stretch from Caernarfon to what was the start of the railway at Dinas, this section of track had been standard guage, no-one had ever travelled narrow guage from Caernarfon to Porthmadog. After rain had lashed the train, as we rose round the side of Llyn Cwellyn towards Rhyd Ddu, I moved up to the open carriage where soggy passengers were sitting in the middle. A new passenger joined us, a man with over 50 years commitment to the railway, discharged from hospital with untreatable cancer and a determination to take part in this historic moment. He sat with pride and dignity in the bubble glass dome of the observation carriage. Another hero of the railway was with us, travelling in an urn, with his ashes to be spread on a particular part of the line at a later date. Descending snake like round the S bends towards Beddgelert the trees were a blaze of autumn colour. More water was taken on at the station and we rode through the Glaslyn Gorge, with walkers below looking up in awe at the magnificent sight. Then onwards, racing across the flatlands towards Pont Croesor and the virgin track beyond. Pretty much on schedule for the grand arrival until, what a coincidence, a broken down lorry was blocking the line! Not on a public crossing, but a private track, leading to the RSPB osprey hide, long ago closed for winter. From my carriage I could see the tail of the lorry one side and the nose the other – I’m told the bonnet was up with a man buried inside allegedly trying to fix the electrics, and no, he didn’t want any help. Miraculously the engine sparked into life 15 minutes later when the ignition key was turned, just ahead of the police arriving. With the lorry gone surely we would be on our way, but why was the railway’s general manager walking down the line with a wrecking bar? Had there been some sabotage? I believe the stopblock would have had to be removed, this is a device to prevent unauthorised traffic using the line, and on a previous occasion the padlock on a stopblock had been super glued by ‘well wishers’. Not Al Qaeda on this occasion, nor an extreme nationalist movement but a disgruntled individual. Way behind schedule we eventually moved on, crossing the construction of the new bypass, before grinding to a halt at the crossroads with Network Rail, we’d missed our slot and would need to wait until the Pwllheli train passed southwards. With much cheering and whistling the steam train and its 350 passengers eventually rolled through the streets of Porthmadog across Britannia Bridge into Harbour Station. After a longer than planned journey, with cups of coffee, there was an abnormally long but orderly queue for the gents. Job done? Well, not quite. As we travelled the fund raising team had been making their way along the train gathering support for a phase V appeal. The title of the appeal is something like ‘Let’s Finish It’ and is looking to raise about £10m for, amongst other things, new stations at Caernarfon, Blaenau Ffestiniog and Beddgelert and 10 new coaches. I could have jumped trains at Porthmadog and carried on up to Ffestiniog but another ride through the gorge and the stunning scenery was too good an opportunity to miss. As we reached the summit of the line we caught up with the straggler in this year’s Snowdonia marathon and overtook a few more along the way down to Waunfawr. Marathon is a fitting word for the Welsh Highland and the spirit of the people that made it happen. If you’d like to see part of the journey click here. Some people say Blaenau Ffestiniog is dull and grey but we know better! I’d heard talk of a mountain lion roaming the Moelwyns and of a panther like creature crossing the road at Coed y Brenin. Then I saw a squirrel sliced in two by Campbell’s Platform. A day later a full grown ewe disembowelled near the bridge into the loop at Dduallt. Who would be next? The ewe looked as though she might have been pounced upon as she walked beneath the bridge then dragged into the bracken for eating. Her stomach was gone with half a dozen bare ribs sticking out but there was plenty of meat on the woolly legs and shoulders. The killer would be back. With vain hope and little patience we sat in a hide, lenses on tripods, as dusk approached. Nothing, apart from a startled walker. Thoughts of our own supper prevailed so we packed and went home. By cover of dark we walked back with stealth taking a wide detour to arrive downwind. The rub of dry bracken on goretex so much louder than on fur. 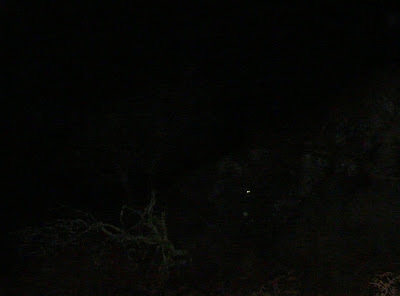 Approaching the bridge, our cameras on, ready to flash, but all to be seen was the dead sheep. The bushy tail of a fox was plain to see. It perched on a ledge, looked down on us then took off upwards across the bracken strewn meadow. And there were the eyes again, even with low power torches we could pick them out a hundred metres away. I stayed put with my beam in its eyes while Haydn approached to within 20 metres, the fox sitting on a stone wall and then, after several minutes, it disappeared into the night. The eyes more arrogant, blue and unblinking than those of a sheep, less round and maybe closer together. No mountain lion this time and I suspect the half squirrel had ignored the signs to ‘Stop Look and Listen’ before crossing the Ffestiniog.